Blake Shelton Explains Cryptic "Karma" Tweet: Was It About Miranda Lambert? Blake Shelton's tweets are open to interpretation—and that's just how he likes it. Last week, the country singer made headlines after he tweeted, "Been taking the high road for a long time.. I almost gave up. But I can finally see something on the horizon up there!! Wait!! Could it be?! Yep!! It's karma!!" The timing was curious, considering the tweet was written just one day after it was revealed that Shelton's ex-wife, Miranda Lambert, is dating a married man. Two weeks after meeting Lambert, Turnpike Troubadours singer Evan Felker filed for divorce from his estranged wife—and in April, she split with Anderson East, her boyfriend of two years. E! News asked Shelton to clarify his tweet after he finishing taping NBC's The Voice Monday. "I don't care what..." he said, trailing off. 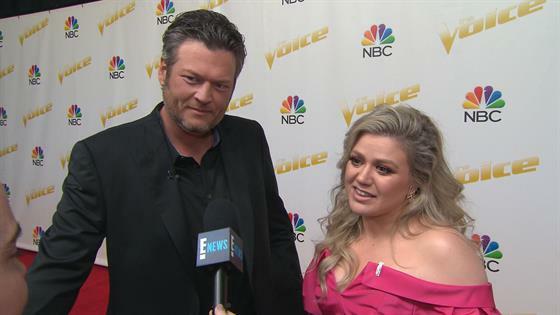 Fellow coach Kelly Clarkson took over for him, saying, "You have to know, y'all: Blake just loves stirring the pot—even if there's nothing to stir! He will literally start a fight between me and [Adam Levine] out of nothing. He just enjoys to sit back and watch—and people take off like little ants! Y'all are playing into it. You are playing into it!" Shelton refused to confirm or deny whether the tweet was about Lambert. "Look, here's the deal: If I meant for people to know what I was talking about, I would have said what that thing was," he said. "I'm not gonna stand here and talk about it. All I'll say is it's amazing to see people turn it into what they want it to be, even if it doesn't even make sense in that context." Joked Clarkson, "You like to stir that pot!" The Voice returns tonight at 8 p.m. on NBC. For more interviews with the coaches, tune in to E! News tonight at 7 and 11, only on E!